VATICAN CITY (CNS) — The presidents of the U.S. and Canadian bishops’ conferences joined leaders of the regional bishops’ conferences of Asia, Africa, Latin America, Oceania and Europe in signing an appeal for government leaders to reach a “fair, legally binding and truly transformational climate agreement” at a summit in Paris. Indian Cardinal Oswald Gracias of Mumbai, president of the Federation of Asian Bishops’ Conferences, signed the appeal Oct. 26 at the beginning of a joint news conference at the Vatican. The appeal calls for decisions that place people above profits, that involve the poor in decision making, that protect people’s access to water and to land, are particularly mindful of vulnerable communities and are specific in commitments to finance mitigation efforts. Colombian Cardinal Ruben Salazar Gomez of Bogota, president of the Latin American bishops’ council, spoke of the “suffering” Amazon basin and the key role it plays in the survival of South America and the world. The Latin American bishops, he said, want an end to pollution, to the destruction of the forests and the disappearance of biodiversity, but they also want justice for their people, the majority of whom do not benefit from the exploitation of resources taken from their countries. “We belong to those most vulnerable groups impacted by rising sea levels,” he said. Many communities — particularly on Tuvalu, Kiribati and the Carteret Islands — already are experiencing the disappearance of land used for subsistence farming or seeing their agricultural land rendered unusable by the infiltration of salt water. Climate change, the archbishop said, already is leading to the phenomenon of climate refugees. Miami Archbishop Thomas G. Wenski, chairman of the U.S. bishops’ Committee on Domestic Justice and Human Development, confirmed that the U.S. bishops asked that a specific temperature target not be in the appeal. Others agreed, he said. “We’re pastors and we’re not scientists,” the archbishop said. 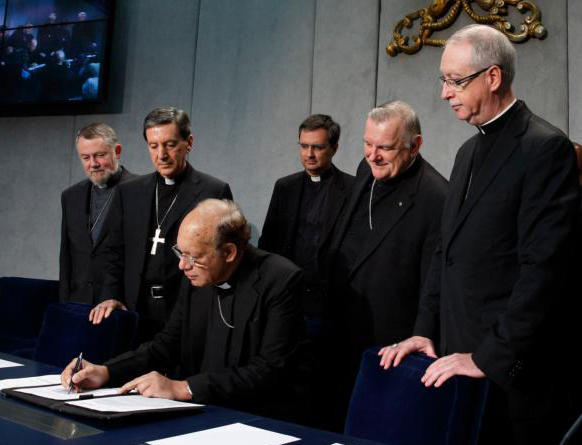 The specific temperature target for reversing the impact of climate change is something for scientists to decide, but the need to act is a moral issue, and the bishops are competent to speak to that, he said. Archbishop Richard Smith of Edmonton, Alberta, represented the Canadian bishops at the presentation. His province, Alberta, is “fossil fuel central,” he said, yet people in Alberta, like in the rest of Canada, recognize that something must be done. “Nobody wants the future placed in jeopardy because of this, and everyone understands intergenerational responsibility,” he said. “Everybody knows that we have to move away from fossil fuels,” he said, but the big question is how. “There are some great minds out there working on finding the new technologies” that will provide jobs and energy without harming the environment. This is maddening. The manmade climate change/ global warming hoax has deceived our church leaders. It’s socialism, a redistribution of wealth. Be good stewards of Earth, yes. ACTION? Not needed. It’s natural and cyclical. That’s political, and our church leaders are wrong.